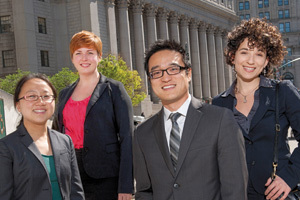 The Immigrant Rights Clinic (IRC) of Washington Square Legal Services, Inc., at NYU Law School, is a leading institution in both local and national struggles for immigrant rights. Our students engage in direct legal representation of immigrants and community organizations in litigation at the agency, federal court, and where necessary Supreme Court level, and in immigrant rights campaigns at the local, state, and national level. Each student, along with a student partner, will typically have the opportunity to represent both an individual or a set of individuals in litigation (such as a removal proceeding or appeal, detention litigation, or a civil suit) as well as a community organization in a campaign (such an organizing project or legislative campaign). We choose our docket in consultation with our community partners and engage in work that is responsive to community needs. Students have direct responsibility for these cases and the opportunity to build their understanding of legal practice and the field of immigrant rights law and organizing. In Lora v. Shanahan, the Second Circuit issued an opinion holding that immigrants subject to mandatory detention must be provided with a bail hearing within 6 months of their detention. The court further held that, at such bail hearings, the government bears the burden of establishing by clear and convincing evidence that continued detention is justified. The decision marks both a victory for IRC's clinic client Alexander Lora, a longtime lawful permanent resident and a husband and father to U.S. citizens, as well as the beginning of "Lora hearings," protecting the due process rights of scores of detained immigrants in the region. The case was argued by Rebecca Hufstader '15 and Luis Angel Reyes Savalza '15, under the supervision of Professor Alina Das, and argued by amici counsel Ahilan Arulanantham of the American Civil Liberties Union. Mr. Lora is also represented by Brooklyn Defender Services, which won his initial habeas petition in federal court and continues to represent him in his ongoing immigration proceedings. The Solicitor General filed for a petition of certiorari (see briefing) to the Supreme Court in the spring of 2016. IRC's brief in opposition was written by Fran Hartmann '17 and Mariel Villarreal '17 under the supervision of Professor Das. A practice advisory on the impact of the Lora decision is available here, and was written by Juan Caballero '16 and Eva Yung '16, under the supervision of Professor Das. In Moncrieffe v. Holder, the Supreme Court issued a 7-2 opinion holding that a lawful permanent resident’s state marihuana misdemeanor conviction, which covers the social sharing of a small amount of marijuana, may be treated as a “drug trafficking aggravated felony” under immigration law. As a result of the ruling, immigrants with such convictions will be able to seek discretionary forms of relief from deportation, such as asylum and cancellation of removal. In its decision, the Supreme Court cited an amici curiae brief written by IRC on behalf of 83 immigration law professors in support of the Petitioner. The IRC brief, authored by Pierce Suen, ’13, and Jordan Wells, ’13, along with their supervisor Professor Alina Das, explains how the government’s position in the case is contrary to the history and application of the “categorical approach,” which limits immigration officials to assessing only the minimum conduct necessarily established by a past criminal conviction. The Supreme Court also cited an article by Professor Das on the categorical approach. Each year, thousands of immigrants are detained pending removal proceedings, and many never received a bond hearing to determine whether their detention is justified. IRC recently won two cases involving successful challenges to the government's intepretation and application of "mandatory detention" to their clients. In December 2012, IRC students Amy Pont '14 and Trang (Mae) Nguyen '13, under the supervision of Professor Sarah Gillman and Professor Alina Das, secured the release of their client, a mentally disabled Vietnamese immigrant with a strong claim to U.S. citizenship, after filing a habeas petition in the Southern District of New York. The government agreed to release their client and he is home with his family. In March 2013, IRC student Kevin Terry '13, under the supervision of Das, along with co-counsel Ruben Loyo '11 of the Brooklyn Defender Services, secured the release on their client after bringing a habeas petition in the District of New Jersey. Their client, a longtime lawful permanent resident from the Dominican Republic, was detained by immigration officials years after his prior removable offense, yet denied the opportunity to establish his lack of flight risk or dangerousness through a bond hearing. The federal court ordered the government to provide our client with a bond hearing, and he was released on bond and is home with his family. On January 30, 2013, one of IRC's clients, a trangender woman fleeing persecution from Mexico, received a grant of asylum in New York Immigration Court. IRC students Anthony Enriquez '13 and Julia Tong '12, under the supervision of Professor Alina Das, represented her. The case presented challenging questions involving the "one-year bar" to asylum claims, a common barrier that many immigrants must address when facing removal to a country where they long ago fled persecution. The case was referred to us by Immigration Equality, and the victory was recently covered in a story by the New York Law Journal. IRC recently won a groundbreaking victory for immigrant rights in the U.S. Court of Appeals for the Third Circuit in Oliva-Ramos v. Attorney General, 694 F.3d 259 (3d Cir. 2012). The case stemmed from a pre-dawn home raid by armed Immigration and Custom Enforcement officials, which resulted in the warrantless arrest of several individuals including the clinic’s client. In Oliva-Ramos, the Third Circuit recognized the applicability of the “exclusionary rule” in removal proceedings to suppress evidence that the government obtained through egregious or widespread violations of immigrants’ Fourth Amendment Rights. The decision is available here. An IRC practice advisory regarding the case is available here. Mr. Oliva-Ramos has been represented by several generations of clinic students since his initial immigration hearings: Adrienne Hernandez ’08, Tim Warden-Hertz ’09, Kate Evans ‘09, Tom Fritzsche ’09 Stephen Kang ’11, Ruben Loyo ’11, Nancy Steffan ’11, and Nikki Reisch ’12. The case has been supervised or co-supervised through the clinic over the years by Haeyoung Yoon, Nancy Morawetz, Jason Cade, and Alina Das. Several NYU alums also played key roles in the case, including Rex Chen, '95, Peter Markowitz, '01, and Connie Tse, '10. The case is now being remanded to the Board of Immigration Appeals for further proceedings, which will be handled by clinic students Abbey Augus '14, and Matthew Craig '13, in the upcoming months. IRC, with Families for Freedom and the Immigrant Defense Project, released a new report highlighting the impact of the Department of Homeland Security’s enforcement practices on immigrant New Yorkers and their families. IRC alum Joshua Occhiogrosso-Schwartz, ’12, is the primary author of the report, which builds on data that Mr. Occhiogrosso-Schwartz and IRC alum Frances Kreimer, ’12, obtained through a Freedom of Information Act request and lawsuit, under the supervision of Nancy Morawetz. IRC won a significant victory its litigation under the Freedom of Information Act to obtain documents relating to the government’s misleading claims to the Supreme Court on their policy towards individuals who are deported but subsequently win their cases. After U.S. District Court Judge Jed Rakoff ordered the disclosure of documents from the Office of the Solicitor General (S.G.) relating to the basis for the claimed policy, the S.G. submitted a letter to the Supreme Court to “clarify and correct” its prior statements, and the federal government released new information regarding its practices for returning deportees. Over the last two years, IRC students Wonjun Lee '12, Saerom Park '12, Nikki Reisch '12, Martha Saunders '12, Nancy Steffan '11, Julie Mao '11 and Marie Mark '10 have worked on these efforts under the supervision of Nancy Morawetz.